To accompany someone you love in that sacred walk toward infinity—there is no greater honor. Watching her pass on without fear, with total peace, in her own home, surrounded by those she loved, that was the very embodiment of Divine grace. We cared for her through her passing in August of last year. My wife, Roxie spent a great deal of time with my mother, as much as possible, and as a family we came together to care for her, including my brothers and sisters. We shared that time, and it was never a burden for anyone, nor did we ever think of it as a burden. We decided we wanted to be there for her. It was the right thing to do, the normal thing to do. Of course we declined other obligations, events and business trips, because the truth is, none of those things mattered. My mother always looked at the positives in life, even in her final days. I would not be the person I am today if I had not had this wonderful lady as a mother. Because of her I always knew I was learning something in the tough times, something that would make me a better person, or help me change so that in the future I could change the outcomes of similar experiences. So when I look back on her transition to her final days, I see it through that lesson she taught us, right up until the end. You learn so much by coming together as a family to provide end of life care for your loved ones. Roxie, my wife, was a rock. And my sister Carol and my brother Jim were all just as solid, as well as my sister-in-law, Debbie. The time was also a gift for the grandkids. One of my sons traveled from Denver to be with her—and told me later it was the best weekend of his life, because they had the chance to talk about things they never would have heard. Every time I think about this, I chuckle. I had never asked her this question. He was taking your Grandpa and I to a movie. To have that opportunity for grandchildren to ask those questions is invaluable. So we, as a family provided care to her for eight beautiful months, each with its own gifts, and on August 30 we said goodbye. But the gifts, the lessons, remain. And my mom was so at peace. It would be wonderful if everyone could pass on like my mom did, with peace of mind, having lived such a rich, full life—not material in any way. My wife Roxie deserves a lot of credit; she spent a great deal of time with my mother and wanted to be with her as much as possible, and my sisters and brothers shared that time. We shared the responsibilities. She was bright and alert, and she was fully mobile, so we provided a lot of comfort care. We shared stories, we were present for her. And we helped her around the house, with whatever she needed. She loved putting clean sheets on her bed, rubbing her feet down with lotion. We were there as much as we could be, providing whatever caregiving support she needed. I really miss your dad. It affected our lives in so many ways. So of course there were things that fell to the wayside, career-related things and social invitations, but in the end we were where we wanted to be, with mom. Those eight months have had a bigger impact on my life than most. As a young boy on the farm, growing up, my time in the Marine Corps and particularly Vietnam were life-changing events for me. But during that time with my mom I learned that what matters most to me now is that I want that same peaceful passing for myself and for my family—my wife, my children and my grandchildren hopefully; for all of us to be able to pass on like my mother did. To have the peace of mind to know that the things you acquire in life—the material things, the brick and mortar—none of those things really matter. Mom knew what really mattered, and that was how she lived her life. It allowed her to pass with grace. It was so graceful that the morning she died, on Saturday at 7: And my younger brother, Jim was on one knee, with tears running down his cheeks. For her, there was no fear, no worry, and even in those final moments she still had limitless capacity for love and compassion for what those around her were going through. I learned so much from spending that time with her; the things we talked about, the problems in the world, how ugly some of those things are. She never had material wealth, but she was among the most spiritually rich people I know. What was the hardest aspect of being a caregiver? What was the most rewarding or fulfilling aspect? I think probably the hardest aspect of being a caregiver is realizing the fact that this can be very rewarding. She was totally prepared. Had we said that we were unable to care for her, she would have accepted that with the same grace that she accepted her passing. We were fortunate that we were able to help her be where she belonged—so she could live out her last days in her humble home, sitting outside on the deck on sunny days, watching the birds in her backyard. Did caregiving change your relationship with your mom? How did she respond to receiving your help? You cannot be a caregiver for a parent without a shift in the relationship. But it is a beautiful shift—it is a chance to repay her in some small way for the incredible gift of life. It is a chance to thank her for always being there. What a powerful choice it is to surrender to that experience; to trust that your needs as a person will be met by your caregiver, and to trust as a caregiver that you have the strength, the love and the compassion to view the experience as a gift. I always had such an admiration for my mother—mothers are so special. In spending more quality time with her near the end I learned so much about how important peace of mind is and accepting the fact that we all pass on. And if you can accept that, like my mom did, it helps those left behind — so they know what decisions to make on your behalf, and they know what to do for the right reasons. What do you wish you'd known when you first started caring for your mother? I feel like mom was so prepared for the eventuality of her passing that she was at peace enough for all of us. And we, as a result, felt that same peace. My advice and hope for others is that their loved ones will do the soul-deep work necessary to feel that same peace when it is their time to go, and then communicate their needs and desires with their loved ones. But the truth is being prepared is important; you can find yourself serving in the role of caregiver for a spouse at a young age, and knowing where to get the help you need and the resources to assist you is very important. Getting our young people to start thinking about these questions, and preparing for the future is as important for them personally as it is for our future as a company. Much has changed since the filming. Mom passed away on August 30 of last year. What she has taught us through this experience will never change. J ournalist Jane Gross's odyssey of caring for her mother Estelle spanned four years. At the time, Jane and her mother were not close, but the process of caregiving reunited them towards the end of Estelle's life. Jane captured her story in A Bittersweet Season: Caring for Our Aging Parents — and Ourselves , a book that explores the crisis of caregiving. I'm not proud of this but it's true: So as I saw it then, I was caught between a rock and a hard place: The rest of my life was a long time, I carry guilt heavily and so, I gulped, and did the right thing, but for the wrong reasons. She spent a long time in an independent living place in Florida, having sold her home for the usual reasons upkeep, driving in winter, isolation by her own choice. During those years, after the rigors of the move itself, she needed little but a phone call once a week and a visit every few months. I would not count myself a "caregiver'' until she returned to New York, where both my brother and I lived, after a health event that we all decided together was the right moment to reunite as a family. In New York she lived for a year in a dreadful assisted living facility that could not provide for her needs, did not explain that properly nor did we ask, assuming it would be like the place in Florida. At that point, again by her own choice, she moved to a fabulous skilled nursing facility nearby. I'd consider those final four years she died in the caregiving time and thus used that period to bracket my book. Since she never lived with me a mutual decision , my primary job was to be her advocate, pay close attention to what was going on in the places where she lived and intervene as needed. Even in the best facilities, this isn't paradise, and it took measured intervention to resolve various problems: I generally saw her a few times a week and talked to her twice a day. In the nursing home, professionals provided most of her hands on care, so our time together was mostly getting to know and love each other. When she concluded that she no longer considered her life worth living, we researched together what her legal options were and I supported her in her decision to stop eating and drinking. While we fought often about small things—who would go away for a weekend so she wasn't without one of us—we were always on the same page about big stuff. By and large, our tasks broke down on typical gender lines: I was also with her alone for ten of the thirteen days after she stopped food and hydration, and again alone with her in the hours after her death. Their relationship was much different—more emotional—and in retrospect it's clear to me that the "end'' would have been way too hard for him and also way too hard for her. Until she was in a nursing home, the constant emergencies and decisions made me feel like I'd been hit by a truck. Just flattened, stupid, overwhelmed. My responsibility to her, and sometimes the time consuming telephone collaboration with my brother, was very disruptive to my work, but being a journalist made that easier because as long as I did what was expected of me, I had plenty of latitude to leave the office for an emergency, and I probably felt more guilty about it than I needed to. I am single and childless so there was no "family life'' to disrupt, but exhaustion and my general frame of mind made social life all but impossible, not in reality but because I simply had no desire or capacity. Again, I did that to myself, and my brother did far better at doing what needed to be done for her and also living his own life. Navigating the role reversal. Because she was cognitively intact, I was never truly my mother's mother. But neither was I her daughter anymore. That is a very delicate dance that changes over time. Getting to know and value her in a way I never had before and vice versa. And, having done the right thing, I had absolutely no regrets when it was over, not to this day. The mother I miss and love is the mother of those last few years not the mother of childhood. She was fiercely independent and hated receiving my help until the point where it was clear she could not manage without it. Then she was both grateful and gracious. I wish I had known that most "emergencies'' aren't really that and do not need to be taken care of ASAP. Most mistakes we made were from the collision of panic, ignorance and moving too fast. This is related to the larger issue of thinking that all the decisions we made actually mattered, when many did not. Very old people die, and regardless of what I did, that was going to be the end point. I'd advise others to admit that to themselves and spend more time just "being'' with a dying parent not trying to "fix'' everything. I also wished I'd been able to set aside the lifetime baggage that most families have. In certain ways we all assumed our roles from long ago. Also, I was not as appreciative as I should have been to my brother in part because I resented the gendered roles, which is a huge waste of energy , wanted him to do everything my way and did not realize until much later that I was trying to win the share of my mother's love that I hadn't had before. Jane discusses how her relationship with her mother improved towards the end of her mother's life. A t the time of filming, Edwin Hendel was living alone in his farmhouse. His daughter Kathi had provided care for her mother who had been diagnosed with Parkinson's disease twenty years ago, and had passed away two years prior to filming. When Edwin's health began to fail, Kathi assumed the role of providing his care as well. The high school teacher and mother of two soon found the responsibilities to be overwhelming and sought relief in the form of an elderly service program that provides at-home daytime caregiving services. Since the filming of this documentary, Edwin Hendel has passed away. In the interview that follows, Kathi reflects on her experience caring for Edwin. If we are blessed with long life, we are all going to be at that point. My dad had worked hard all of his life, providing for his family, making sound decisions so that the family farm would be a reliable shelter for his family, and he and my mother gave me a wonderful and loving childhood. Even as young adults, they loved and nurtured their children. Therefore, when the time came for my parents to need support, it came naturally. They invested in me and my family, therefore, I wanted to invest in them. My mother was stricken with Parkinson's disease over 20 years ago, therefore my caregiving began with her. My dad enjoyed good health up until about 5 years ago and since I was there taking care of mom, it just seemed natural to began taking care of dad's needs as they developed. I probably spent at least 3 hours per day dealing with my parent's care. I was in charge of scheduling care workers, paying them, groceries, paying bills, working out insurance issues, making sure the medications were in the house and then preparing weekly pill boxes. I also had to keep their old farmhouse in working order so they were safe, warm, and had their needs met. One of my brothers helped out on weekends when agency care didn't provide coverage. He would do the morning duty of helping them with breakfast, clean them up as needed, help with dentures for my mom , medications, and setting their television for the day. There were many family members who visited regularly and brought my parents special food dishes prepared just for them. These visits meant the world to them. Also, we made sure that Mom and Dad were included in as many family functions as possible so they could still enjoy their holidays and visit with family. The care I gave my parents blessed my life in many ways and allowed me a closeness that often adult children and their parents don't have the chance to share. I will admit that many times it was difficult to cover all the bases because during this time I was working full time and managing my own family and home. I often felt like I was running a three-ring circus and many times I felt overwhelmed. However, my parents' only wish was to stay together in the farmhouse where they raised their family so I felt I must do all I could to honor that wish. Often, my husband and I would be entertaining at our home, and I'd have to leave guests to do the evening duty with my parents, then run back to my guests and get on with my plans. Vacations were difficult because I had to have every detail of their care worked out before I could leave and often was called while on vacation to work out an issue. My parents were older when I was born so most of my friend's parents were still active and independent. I had many people advise me to place my parents into a nursing facility so that I could have my life back. That plan is easier said than done and it wasn't an option for our situation. 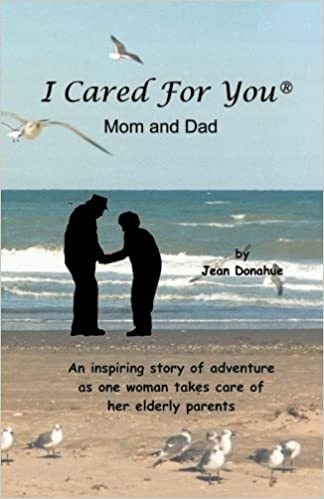 The most difficult aspect of being a caregiver was the amount of time it took to cover all the details and considering I filled this need for a number of years, it often was overwhelming. Also, caring for people who are never going to get well and only decline as the days pass can be depressing, too. The most rewarding aspect was my parent's appreciation. They each would often say, "I just don't know what we'd do without you, thanks so much for what you do for us. Also, my children learned lessons watching me and what you do for family that they could never learn any other way. I think caregiving changed me in understanding how short life is. How sad it was for each of my parents to once be vibrant, hardworking people and then to see their bodies begin to fail them even though they would have loved to been active and independent again. Caregiving changed my dad by making him come face to face with his limitations. It seemed that he was always losing something like, the permission to drive, to handle his finances, to cook on the stove, to go outside alone, etcetera. While caring for Mom, Dad and I became a team. He was doing his best for her and I'd help him out until he couldn't do it anymore. Then, I covered everything. My dad was always working while I was a child and the time we spent together later in life allowed us to really get to know each other. At first, Dad wanted to remain independent as possible and didn't want the help. Later, he realized his limitations and appreciated the care. After Mom passed away, the caretakers and family visits were priceless because he was so lonely. I guess, I wish I'd realized how much work would be involved. I underestimated the time it all would take and the physical and emotional toll it would take on me. I advise others who are considering this journey to realize the elderly wouldn't be in this position if they could change their circumstances. Also if you're going to take on the responsibility, do it with a happy heart. Don't make them feel like a burden. I have a huge amount of time that I am not sure how to fill. Even though, the caretaking responsibilities weren't especially enjoyable, they did constitute a large part of my life so now, I'm in search of positive things to fill that void. I'm pleased that our elder generation is getting the attention they deserve through efforts like this production. It's been said,"Care for the young, the infirm, and the elderly because if you live, you will have been all of these people before your life comes to an end and you would expect the most dignified and loving care possible. N icole's father Billy was absent from her life for many years, but when his health began to decline, Nicole, a single working mother, took on the responsibility of providing his care. At first, she struggled to understand how he could move from moments of clarity to moments where his memory failed him. After using a program that provides online support through virtual face-to-face interaction with caregiving experts and other caregivers, she learned to recognize the symptoms of her father's dementia and is now better able to manage the challenges she faces as a caregiver. And even though he really wasn't a father to me, he's still my father. I take care of my father because of the way my mother raised me. My mother never made my father do anything so he didn't and thus is the reason for meeting him for the very first time when I was 11 and then never seeing him again until I found him when I was 19 when my mother died. When I was 38, he decided to find me and establish a relationship. Thus it was a combination of my raising and him finally making a decision to reach out that help guide that decision, but ultimately it was my faith in God and the scriptures that say,"Honor thy mother and thy father that thy days may be long upon the earth. My giving schedule has changed and evolved over these years. Then I was given two hours a day for 5 days a week respite which didn't provide much help. Then they increased it to four hours for 7 days and that was awesome. The greatest thing that helped me was when they provided day care several months ago. I now can hold down a full-time job and take care of myself which is a great deal for me. So my caregiving schedule is to get him ready for daycare, ensure that he has a breakfast and dinner meal during the week and all meals on the weekend. I ensure that he goes to doctor and that he has clothing. I do everything for him that he would do for himself if he was able to. No, I don't share duties with anyone. W ithin the span of a month, Chris Olson was diagnosed with Alzheimer's, and her husband Brent was diagnosed with prostate cancer. I love when she is having a clear day. And, having done the right thing, I had absolutely no regrets when it was over, not to this day. Cracking the nut of unconscious behavior takes time, patience, and self-love. At this time, I feel my main thing to do as a caregiver for my mom is to make sure she continues to feel needed as a member of our family and that her input into life matters to all of us. My children have to see beyond their needs to the broader family. Kathi I'm pleased that our elder generation is getting the attention they deserve through efforts like this production. I use to try to count on my two youngest daughters but they proved not dependable so I just have to do things myself. It boils down to that everyone doesn't share your same level of care and thus can't be expected to treat your dad as you would. Caregiving has completely changed my life. It's like you have a young child. You have to get someone to watch him if you want to go somewhere; you have to pack pull-ups and a change of clothing when going out; you have to answer the same questions over and over again. I can't date, I have to work jobs that afford me the ability to leave and take my dad on doctors appointments, etcetera. I even had to stop working for almost a year. My life revolves around my dad. I'm not complaining because I signed up for this, but i must say that it has consumed my life and it is something you most definitely want to do or you would not last. The hardest thing about taking care of my dad is that fact that he is so rude. He curses, he's defiant, he's oppositional, and due to his memory lost and other issues he doesn't think anything is wrong with his behavior. The most rewarding thing would be the fact that I know that my father is being taken care of in a manner that I can sleep at night. I believe we reap what we sow and thus I can only hope that if I'm ever in a place in which I need someone to care for me that they care for me as I care for him. Caregiving has changed me to the point that I am more boisterous and I now recognize my limits. It has also pointed out the need to take care of myself. As far as my dad goes, since I didn't know him, I don't know if he has changed or not. My dad and I have never had a relationship so this hasn't changed anything. My dad seems resentful of me helping him because he feels that he doesn't need it and thus he lashes out every time he is given the opportunity. I wish I had known how limited or hard to access resources are for people in these circumstances. I would have gotten a DPOA so that I could have the power to make the decisions that I need to make on my father's behalf. I would tell people about all the community services, VA services, and other things, like food stamps, medicaid, etcetera that are available to help with the financial hardship this places on the caregiver. Sadly, your parents could one day be fine and then suddenly the next day need a great amount of care, so the more prepared you are in. Even a sense of filial duty can help: your parents did the best by you, now it's your turn to do the best by them. But does a parent forfeit the right. I would tell them to ensure that you count up the cost and discuss it with those close to you so that they understand the change that is about to occur. Mainly, don't lose you, and take time to take care of you. I have more knowledge but I'm also more frustrated with the process. I'm also very thankful that my dad is a veteran and that I now have the know as to the benefits afforded to him. I thank you for letting me see that what I am doing is something big and not just an everyday thing. I went into this thinking that this is just what everyone does. I've learned that this is something extraordinary. Filmmaker Michael Kirk highlights the challenges adult children face as they transition into the primary caregiver role for their aging parents. Meet each caregiver and explore their experiences. Anthony For the love of my mother. Anthony I have been doing this for the last five years. Anthony It becomes 80 percent of your life. Anthony My sister helps. Anthony The hardest part is watching a love one change from being strong to not understanding life anymore. No Longer Alone Anthony recounts how he learned to accept help after his mother's diagnosis. My Little Ladies Rochelle relies on a support group of women to help her through the challenges of caring for her mother. Alisa We have had personal aides come in for several years, starting out with just a few hours a week when she was in her late 90s to now, when she is and has help about 50 hours per week. Alisa The main things I do are to supervise the caregivers, make doctor appointments, and arrange for things like new telephones and special lighting to help her read. Alisa Most of the actual caregiving is done by two aides. Alisa There is always a faint worry that never goes away when you have an elderly parent. Alisa The hardest part is having to fight my mom to allow us to provide the care. Alisa My mother hates having lost so much of her autonomy. Alisa I absolutely recommend working with a case manager. Alisa We have increased the number of hours we have help. Why We Caregive Alisa and other family caregivers discuss the joys and challenges of caring for their aging parents. Geriatric Care Managers Alisa relies on geriatric care managers to mediate the situation between her and her mother to relieve some of the stresses of caregiving. Breanna My mom gave me life, kept me safe and made sure every day was the best it could possibly be. Breanna My mom is still doing very well. Shanna I believe my family is caring for my mother 24 hours a day, 7 days a week. Shanna In every aspect of my life, caring for my mom is always present. Breanna The hardest part of caregiving, at the stage my mom is in now, is the emotional toll it takes on her and our family. Shanna The hardest aspect of being a caregiver is knowing that today might be the best day I have with my mom. Shanna The most fulfilling aspect of caregiving is being able to support my parents. Breanna The most rewarding part is seeing her smile on her good days. Shanna As I sit on the couch, typing out these answers, I have tears running down my face because talking about this is difficult. Breanna My sister and I have always had a close relationship with my mom. Breanna This is a double-edged sword for me. Shanna I wish I would have known that my mom would be so isolated so early in the disease. Shanna Being miles away from my parents for so long, allowed me and my husband not to realize how the disease has truly progressed. Shanna As we are caring for my mom, we are also talking to our dad on ways that he needs to care for himself. Family is Family Shanna talks about her decision to move home following Chris's diagnosis. Why We Caregive Breanna and other family caregivers discuss the joys and challenges of caring for their aging parents. Mary Ellen Simply put, we are family. Mary Ellen My parents moved to the community I live in ten years ago. Mary Ellen Most every day, I stop to see my mom. Mary Ellen I have a brother who lives in the area and travels extensively for business. Mary Ellen Caregiving responsibilities need to be prioritized and time allocated to them. Mary Ellen What social life?! Mary Ellen The responsibility of it all. Mary Ellen The sweetness of it. Mary Ellen I am not sure about changing me. Mary Ellen Role reversal is an interesting experience. Mary Ellen Both my parents have been receptive and have appreciated the support. Mary Ellen Caregiving is often a gradual thing and seems pretty doable at the onset. Her Wingwoman Mary Ellen's daughter Laney supports her mom through the challenges for caring for Laney's grandmother Anita. Why We Caregive Caregivers discuss the joys and challenges of caring for their aging parents. Alicia She is my mom, she took good care of me when I was a kid and as an adult! Alicia It will be 5 years June 1st of this year since we have been caring for my mom at home. My dad, brother, and daughter share in the caregiving along with four PCAs. Make Them Proud Carissa remains close to her grandmother despite Estella's declining health. Caring for an elderly parent is hard work and takes its toll but the bonds of love and affection can make it easier. Even a sense of filial duty can help: But does a parent forfeit the right to expect care if he or she has been cold, selfish, neglectful or violent towards you in the past? What justifies turning your back on a needy parent? But more than that, she says her father sexually abused her. Along the way, she broke off all contact with him and her siblings. This is an important subject for carers to talk about. For some it may be an instinct for self-preservation that steers them away from an elderly parent regardless of what people, including nursing home staff, might think of them. Information Architecture with XML: A Management Strategy. Christ Alone: An Evangelical Response to Rob Bells Love Wins? Perhaps there is a new way to view the relationship so it doesn't hurt so much..
Of the 1, carers surveyed, 18 per cent had been subject to physical, verbal or sexual abuse in childhood and 9 per cent said they had been neglected. People can be more forgiving of parents who neglected them rather than abused them, it seems. Do you have to go out? Her brother ended up in jail. She said it was easy for others to judge. But when a parent has not been a caring parent, how can you be a caring child? Marilyn will not be trapped. Coming of Age is updated every Monday. I know that with both my parents, and in particular my father, old animosities and rivalries were replaced with love and care whereas my brother still expected parental praise and was unhappy when this was not forthcoming. People need to step out of the role played as a dependent child and be more giving; it can be liberating. This is indeed a hard one. My first thought is why would you bother. I know a young woman in just this situation at the moment. This man was a wonderful father and really the only decent parent of the two. She is often still very cruel to her daughter even though her daughter is the only person in the world who gives a toss for her. My young friend does not have a lot of money, rents, has many good friends but longs for a caring partner. I really admire her. I have stopped telling her to abandon her Mum. All I can really do is offer her my respect and support for when she is down. Abuse in a family so often transfers from one generation to another — an abused child can so easily become an abusive parent. I certainly believe this was the case in my family. My brothers and I grew up in an emotionally abusive family. When my mother died I was left to care for my steadily dementing father who had been in his 50s when I was born my mother was much younger. My older brothers removed themselves from all responsibility out of hatred for our father, leaving me as the only sibling shouldering the care for almost two decades of my life. This has caused irreparable damage in my relationship with my siblings. Caring For Aging Parents In Today’s Busy Society | Aging In Place. My parents don't care about me - The Mix. Havana Before Castro: When Cuba Was a Tropical Playground? CARING FOR AGING PARENTS IN TODAY'S BUSY SOCIETY! The 2009 Middle Class Dilemma (Middle Class Logic Book 1)! I realized any contact I had with them was causing me enormous damage. But in the end, all I really feel is regret and sorrow at the way we were brought up, and some understanding of the violence and fear that my parents grew up with. Despite bringing them up in a loving and stable home, devoid of abuse, I have low expectations of my kids caring for me in old age. This might be partly because my parents sorted out their own issues in old age and asked little of their children. For most people with old parents, life is complicated and demanding, juggling kids and jobs with many moving long distances away from parents. All of us children sided with our mother and kept away from our father as we grew up. My mother died when I was 30; in my late 30s, I felt driven to re-establish contact with my father, to try and reduce his mental hold over me. By this time he was an old man. A different relationship was established. Then he had a mild stroke and had to move into a hostel. He made me his power of attorney and I spent the next three years managing his finances and his life, then his death and funeral. Some of my siblings did have contact with him during that time, but some would not. One of my sisters, however, is still mentally dominated by memories of childhood, still feels oppressed by that towering figure, as she refused to meet the real, diminished old man. Congratulations to Marilyn for turning things around and she is definitely doing the right thing in protecting herself and her family by having no contact with her abuser. How do you sacrifice your time, effort, love for someone who has harmed you? I know someone whose dad was lovely but mum was emotionally absent, vain and self-preoccupied. They grew up in an expat situation with nannies, servants, etc, so the mother never had to do any of the close work of mothering. Fast forward 60 years, dad has died, mum still going strong in her late 90s, circumstances much reduced. The adult children are extremely involved with her, they jump at her every whim. But it is all on her terms, them looking after her, she shows no interest in or awareness of their lives. I was physically abused by my father. I carry a lot visible scars but the mental scars go much deeper. My father was a very angry man. His fits of rage most often turned violent. I realised in my early 40s I carried a very bad attitude towards my father. With the help and encouragement of my wife, my mother and close friends I was able to see my attitude to my father was poisoning me. I had to confront my attitudes to my father and deal with them so I could be healed. It took much courage but eventually I asked my father for his forgiveness. He was eager to bury the hatchet. Sadly we were never particularly close after the reconciliation. I realised later in life we sadly shared very few if any good memories of doing things together. It required boatloads of patience and the giving of much love. This was very good for me. I also took the view at this time my father belonged to a different time. I have two great sons that have excelled academically and career wise. We are a very close family. I also have two grandsons 2 and 4 that are just adorable and I am sure they will grow up to be very fine young men. I have so much fun playing with them and wrestling with them. Think I have learnt from my bad experiences. I very much appreciate your contribution Geoff. Thank you — I realise the pain it must have caused you to rake over these memories. Well written Geoff — it is good to be open hearted enough to allow a different experience of an aging parent. Geoff, you have shown great courage and honesty about how hard it has been for you to write what you did. It is another step of growth, another shoot that has sprouted that will bring about a good result. You can only grow stronger from a bad experience because you made a decision that changed your path. You made the decision to ask your father for his forgiveness. That was the step that was vital to begin the healing for both of you. Deep down, your father may have actually realised what a terrible error he had committed against you. Keep going forward, and Geoff, when your grandsons have grown, they will remember you as a loving and fun to be with grand-dad, a role model for their lives. The difficulty in my experience is when one child takes on this role and other siblings do not assist the one left shouldering all the work, exhaustion and responsibility. However the discord this caused between her and her siblings is still bitter and they have never reconciled with each other. Thank you for this discussion. I can not go in to details but at 60 After years of anxiety I have been diagnosed as having PTSD due to parental behaviour in my childhood. I have had to retire early on health grounds which was not part of my life plan. However my husband and I have raised 2 loving children and now have a delightful grand daughter. The conflict between anger I feel about my past and guilt as I watch my mother slide in to dementia is profound.